With the daffodils popping up in the garden and lambs being born in the nearby farms it's a sure sign that Easter is on the way. Hotel Chocolat have a wonderful collection of gifts this year and we received the Easter Goody Bag to put to the test. It contains a selection of luxury products that are ideal for sharing with your loved ones, although you may want to hide them away and keep them all to yourself as they really are so indulgent and so beautifully presented! 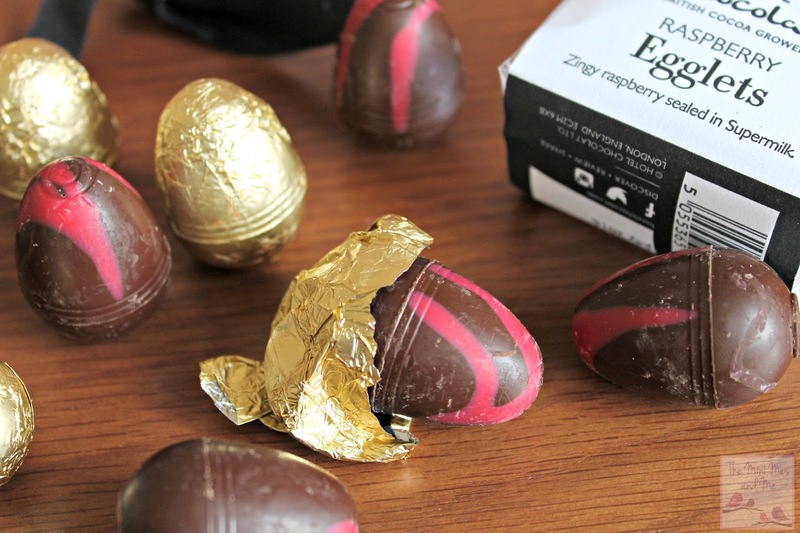 The bag of 8 Raspberry Egglets are darker chocolate treats with a seriously sour centre. They are wrapped in gold foil for an added touch of elegance and they are so moreish. These were probably my favourite in the set. Next there is the Bunny Selector pack - 6 40% milk bunnies oozing with runny caramel. They are nice and chunky in size so just the one would satisfy a sweet tooth. Each complete with a bow tie they are in a class of their own. This little trio of cute rabbits come individually wrapped within a card box for ultimate freshness. 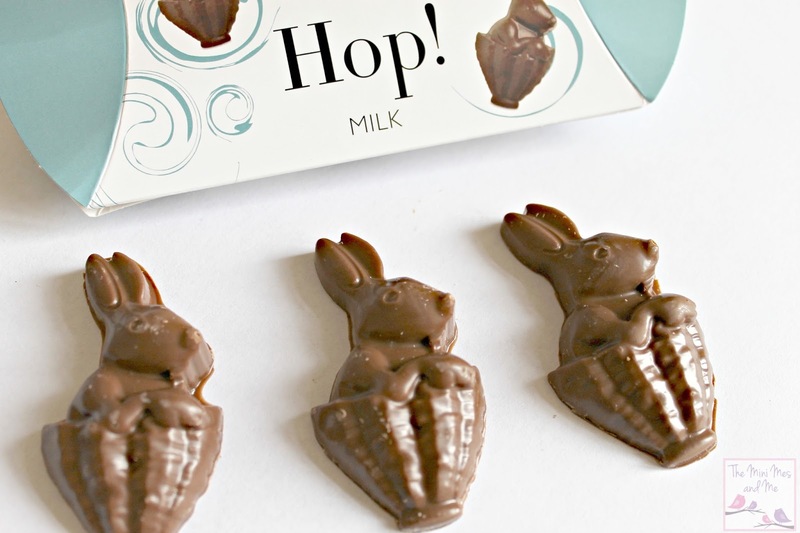 The milk chocolate is so rich and creamy too - they would be great for hunts this Easter. There is also another trio included, Scrambled Pralines with a smooth, melt in the mouth middle and finally a miniature Salted Caramel slab to devour. Perfectly portioned for an individual to enjoy. If you're looking for some alternative gifts this March to the traditional egg then I'd certainly recommend this Goody Bag with such variety within. There is something for everyone. For your chance to WIN a Hotel Chocolat Easter Goody Bag you can enter via the Gleam entry form below. The giveaway ends at 11.59pm GMT 23rd March 2016 and is open to UK residents. Only the ones made with chocolate. I like the sound of the scrambled pralines. Yum! Raspberry Egglets, dark chocolate is my fave! The Raspberry Egglets sound lush! The salted caramel slab sounds gorgeous! Raspberry egglets sweet & sour like me! The Bunny Selector Pack with runny caramel sounds yummy ! The Raspberry Egglets sound yum! 8 Raspberry Egglets sound divine. Those Bunny Selectors can hop straight into my mouth!! The salted caramel slab sounds AMAZING!!! The Raspberry Egglets sound delicious! The Raspberry Egglets sound amazing! The Scrambled Pralines sound good to me! Salted caramel slab! Put Salted caramel in anything and I am sold! Oh my! The scrambled pralines look as good as they sound!! The raspberry egglets sound delicious - and as raspberries are my favourite fruit will they count as part of my five day! ! The Raspberry Egglets sound yummy! The scrambled pralines sound divine! Any good quality chocolate is good in my book! The bunny selector pack looks fantastic. The trio of scrambled pralines is my idea of eaven! The salted caramel slab, yum! Scrambled Pralines...had me at the word praline! The raspberry egglets, grow raspberries at home and little 'un loves them, AND chocolate of course. Who doesn't?!! Definitely the Raspberry Egglets. They look great! The bunny selector pack. Had a taster in hotel chocolate over the weekend and it just hits the right spot! The bunny selector pack, I love milk chocolate and caramel! Scrambled Pralines sound absolutely delicious, I love love love anything with praline center! The raspberry egglets look absolutely amazing! The bunny selector pack - those ears are just waiting to be bitten off! Scrambled pralines are my favourite , but only just ! The trio of rabbits, they're so cute! IF it is made of dark chocolate I will eat it, if not my wife will! The Raspberry Egglets are right up my street yum ! Hotel Chocolat is my fav i would love to win this! The raspberry egglets - nom nom they wont last long! Any of them! 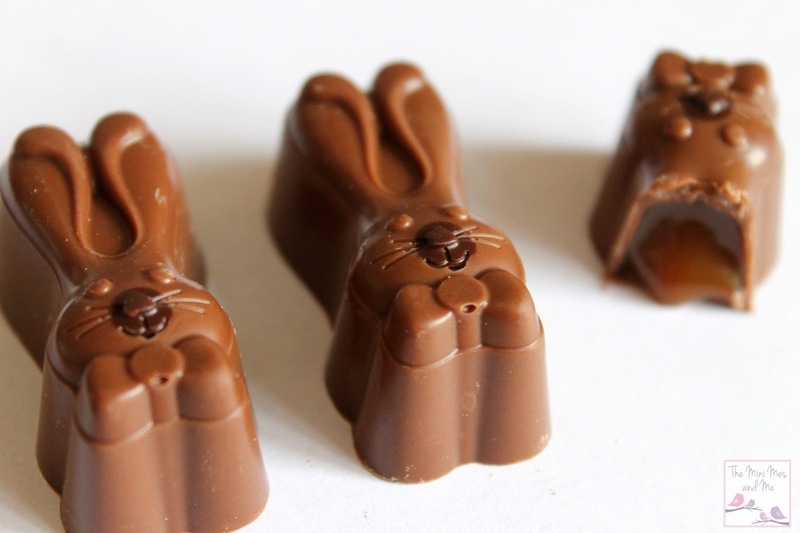 But my favorite would have to be the caramel bunnies! I love caramel so the Bunny Selector pack looks delicious! The raspberry egglets sound delicious!!! the bunnies sound good to me! I'd bite off those bunny ears first! All spunds rather tasty! Think i would chomp on the Bunnies 1st! It would be really necessary to try them all, but I really fancy the salted caramel slab. The Raspberry egglets sound wonderful. The mini Salted Caramel slab. I would like to try the Scrambled Pralines, they sound yummy. The Bunny Selector pack would be my favourite. the raspberry egglets look fab!! The bunnies! They look super cute and super yummy!